In The Gilded Auction Block, Shane McCrae considers the present moment in America on its own terms as well as for what it says about the American project and Americans themselves. Shane McCrae is a shrewd composer of American stories. 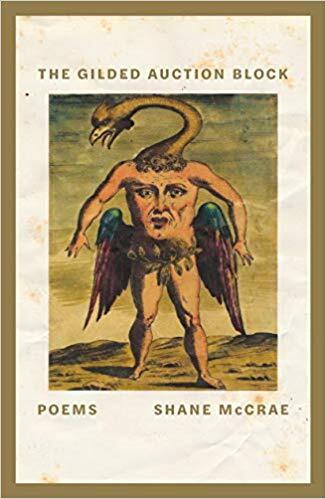 His poems often piece together, for striking effect, swatches of material from divergent sources ... What makes McCrae’s compositions so ingenious are their marvels of prosody and form ... The result is beautifully up-to-date, old-fashioned work, where the dignity of English meters meets, as in a mosh pit, the vitality—and often the brutality—of American speech ... The first two lines so nail Trump’s rally patter that you can almost hear, as punctuation, the crowd’s roars ... New clusters of meaning, pressurized by the line breaks, undermine Trump’s familiar rhetoric ... Because his style is so distinctive, he’s a presence even when he’s not the principal subject: the voices in his poems are hammered into his style ... part of the urgency we pick up from his poems seems to stem from his realization of how many unheard voices are still left ... This is partly a book about current events, with poems about Jeff Sessions’s confirmation hearings and a bill that attempted, and failed, to undo Obamacare. But its heroic dimensions emerge from deeper in the subconscious ... The authority in these lines arises, as with everything in McCrae’s work, from speech heard so clearly you want to punch that punk bird. As with the best of McCrae’s work, the spark in these new poems lies not in their openings, which sometimes veer toward the heavy-handed, but in their unnervingly elegant resolutions ... McCrae knows how to write last lines that prick the heart and snap us into sudden perception ... He’s especially eloquent when observing, with an almost theological rigor, how familiar concepts—particularly the dichotomies of 'black' and 'white,' 'love' and 'hate'—become all the more amorphous in an unjust society ... As in his other books, you’ll find an array of styles and modes here, including first-person confessionals, historically rooted monologues, and...an extravagantly imagined infernal vision in which birds bark expletives and a giant beetle intones Trump-like boasts ... At times you can feel McCrae straining to broaden the scale on which oppression is depicted, to break it out of the typical autobiographical and sociological frameworks and see it for the intricate cosmology it is. Still, what fuels his most riveting moments are the smaller-voiced intensities ... If The Gilded Auction Block is more inconsistent than McCrae’s previous work (a fair amount of which is astonishing), the cumulative impact is still a powerful thing to reckon with. This sprawling yet astute collection revisits the brutal history that enabled the election of Trump ... McCrae is at pains to show how, in Trump’s America, the mere fact of blackness is often a threat to whiteness ... In McCrae’s timely observations, the American Dream is an illusion that silences its victims. What did you think of The Gilded Auction Block: Poems?